For his third Hong Kong project, following Ophelia and J Boroski, designer Ashley Sutton has, in a way, come full circle. Before turning to interiors, the Australian worked in his native country’s booming iron ore industry, which led to his penning and illustrating a trilogy of children’s books about miners trapped underground and making fairies from iron. This undertaking pushed Sutton into making actual iron fairies and a real-life story was born. 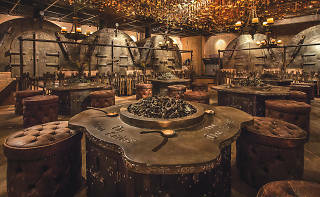 This new Pottinger Street bar is the third in the Iron Fairies trilogy Sutton has opened with master mixologist Joseph Boroski, following success with the concept in Bangkok and Tokyo. Visually, there’s a lot to take in here. 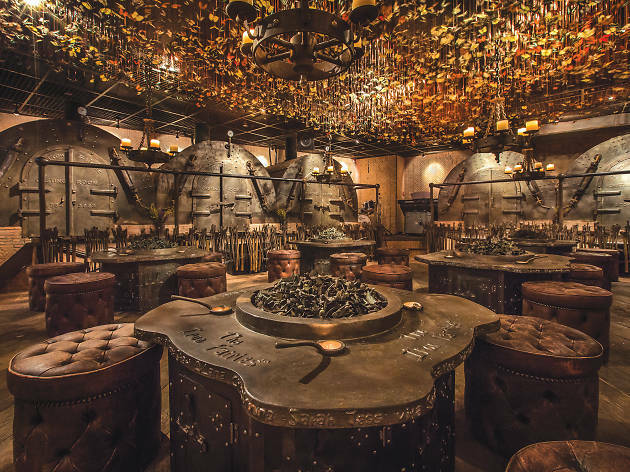 The most immediately arresting feature is the hanging garden of 10,000 preserved butterflies elegantly dangling from the ceiling, a sharp contrast to the rest of the 80-seat space modelled on an ironsmith’s workshop and furnished in raw iron, with accents of timber, leather and mining machinery throughout. We order a watermelon daiquiri ($115) with organic honey and a fairy dust burnt marshmallow. Starting sweet, it’s smoothed out nicely by the honey. The Smoke in a Bottle ($120) is presented in a smoke-filled glass bottle and poured at the table over ice cubes. Here, a blend of house-infused blueberry vodka and elderflower liqueur could be better offset with more homemade sage cordial, but the overall smokiness is addictive nonetheless. Saying that The Iron Fairies is a great new addition to Hong Kong’s bar scene would be underselling it. Rather, it’s the culmination of an entire vision, one that’s been executed with nothing but class. Hong Kong is lucky to be part of the story.